My Robi app install and get 250 mb internet free.Robi brings an amazing free internet offer, Where all the Robi customers has chances to get 250 mb free internet from My Robi app.My Robi App helps you take care of your all Robi Prepaid & Postpaid account; also connect with your all lifestyle needs - conveniently in one place, on the go and with no data charges! Just download the My Robi latest update from Google play and login on the app & simply get 250mb free internet. New packing and new feelings! Easily view your own Robi account. The feeling of uploading photos to your profile. Know your own usage and charging information. Online recharge and bill payment. Recharge / scrutiny from scratch card pin. Balance Transfer to other Robi prepaid account. Turn on all existing Value added services and close them. Check your own loyalty category, offer offers and rewards. 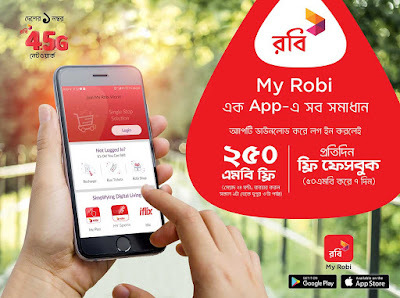 Robi store locator to find nearest Robi store. Check the usage and history of its own Robi App Store. if you have any questions about My Robi App Download 250 Mb Free, then comment we will replay you back soon.